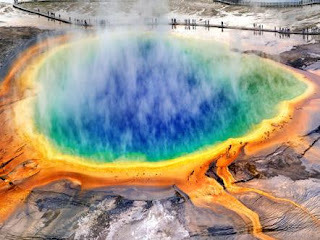 According to the experts, an eruption of the Yellowstone volcano would cause a real catastrophe not only in the United States, the country where it is located, but also on the entire planet Earth. The fact is that the volcano actually represents an outlet for the enormous lake of underground magma that underlies Yellowstone Park. Yellowstone is one of the most monitored volcanic regions on the planet. It is not for less taking into account that the caldera of the volcano on which it sits is a lava "pool" of 88.5 kilometers long by 32 wide and a maximum depth of 14 kilometers. Humanity was already in serious trouble when about 74 thousand years ago exploded the Toba volcano, located in the current Sumatra. The force of the explosion at that time was 10 thousand times greater than that of Mount Santa Helena, which occurred in 1980, and caused the most devastating climatic consequences of the 20th century, covering the entire planetary sky with ashes. The biologist and geologist Michael Rampino of the University of New York notes that, as a result of the volcanic ash, the temperatures of the high latitudes increased their values up to 21 degrees Celsius and three quarters of the plant species of the northern hemisphere perished. According to Sally Sennert, a volcanologist at the Smithsonian Institution, Yellowstone is an 8 in the Volcanic Explosive Index, an estimate of the strength with which a volcano can explode. Mount Santa Elena, whose eruption in 1980 swept 388 square kilometers of forest and killed 57 people, was a 4. The progression of the index is geometric. An 8 like Yellowstone is 10,000 times more powerful. Geologists agree that it would be an explosion like none we have known so far, and we have known a few. The Yellowstone volcano has behaved regularly with a cycle of eruptions every 600 thousand years. The last verified by science happened 640 thousand years ago, which is why many consider imminent the next big eruption. While it would not entail consequences as serious as the eruption of the Toba volcano, it would nevertheless be 2,500 times larger than that of Mount St. Helena. However, in early March, scientists recorded four earthquakes near the Yellowstone volcano. The most recent earthquake took place on the 11th, when an underground earthquake measuring 1.5 points of magnitude occurred. A few hours later, an earthquake of 1.8 magnitude was recorded, which caused some concern among Internet users. Some small earthquakes usually occur in the area about 50 times each week. However, the 1.8-point earthquake triggered a notable concern. Internet users published numerous messages about the possible eruption in social networks. "Yellowstone is about to explode and it will affect us all," wrote one RyGuy. However, the scientists did not take long to reassure people. Thus, the meteorologist Tom Skilling declared that the week had been quite calm from the point of view of volcanic activity and that people should not worry about the possible eruption of the supervolcano. The volcano has not erupted for some 700,000 years. However, experts say it can explode approximately every million years. If it erupts, some 87,000 people would die, and two-thirds of the US territory would be uninhabitable. It is estimated that the area of direct destruction caused by the blast wave would be approximately 60 kilometers radius around the park. But, the biggest problem would be the millions of tons of ash that the volcano would release into the air. These ashes would first increase the temperature of the planet like a greenhouse, to cool it later in the equivalent of a nuclear winter. The change in climate would be dramatic and would end most of the crops. A large amount of ash in the atmosphere would not let sunlight reach the Earth and directly affect life in the territory, causing a 'nuclear winter'. The ash, when falling, would also poison aquifers and destroy much of the equipment manufactured by man. If the volcano were to explode, climate change would occur, since the volcano would emit large amounts of sulfur dioxide into the atmosphere, which can form a 'sulfur aerosol' capable of reflecting and absorbing sunlight. The consequences, in short, would be global and very serious, but the possibility is so remote that we can continue speculating about it and admiring how destructive nature can be.